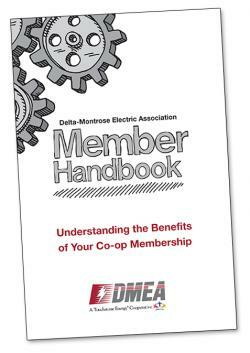 Member Handbook | Delta-Montrose Electric Assn. DMEA is proud of our cooperative heritage and the work we do to serve you, our members. The Member Handbook provides an overview of DMEA, how we operate, our programs and services, billing procedures, and commitment to the local communities. All new DMEA members receive a copy of the Member Handbook when they sign up for service. You can also view the handbook online by clicking the image to the right.